In a society where unwanted teens are salvaged for their body parts, three runaways fight the system that would “unwind” them. Unwind by Neal Shusterman is one of the books that I never thought I’d get. If I were just book shopping on a normal day, I don’t think I would have picked this book up. But if it wasn’t for the Powerbooks sale and the fact that most of a lot of my Goodreads friends recommended (or in our terms, pushed) this book, I wouldn’t have gotten it when I saw it. …human life may not be touched from the moment of conception until the child reaches the age of thirteen. …on the condition that the child’s life doesn’t “technically” end. 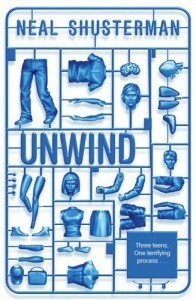 I didn’t really understand what unwinding was until I was a few pages into the book. Apparently, unwinding is the process where the child’s organs and basically every part of him/her (blood, vocal chords, fingers, hands, feet, spine — name a body part, they have it!) is harvested and stored for other people’s use. Once a child reaches the age of 13, the parents have the prerogative to have them unwound. They just fill out a form, submit it and the kids get picked up for harvesting and they never have to see the kid again, and they can go on living their lives. Except, how could they go on living their lives (and do something like get a Branson vacation package) after doing something like that? I honestly don’t know. It’s a sick, sick world that our main characters Connor, Risa and Lev lives in. I find myself wrestling with that question and more as I read the novel, and I don’t think I even have a final answer to those questions, too. The novel started out slow as the author set the stage for each of the character. For a moment, I was afraid it would be just like The Barcode Tattoo because of the way it read at first, but I was glad when things started to pick up and the characters started to shine and the plot started moving. There are a lot of characters in Unwind, but I was never really confused at any point in the story. Perhaps it’s because the chapters are clearly labeled with whose point of view we are seeing, but I think it’s also because the characters are well-made. There was never a black-and-white character there — all of them had their different shades of gray. You can’t expect the kids featured in the novel to be happy because their choices have just been taken away from them, and it was interesting to see what choices they made given their situations. Out of all characters, I was very interested in Lev’s transformation — from blind faith to darkness and to getting to the path to find his faith once again. I didn’t like him at first, but his journey in the story was the one that touched me the most. Connor and Risa were equally interesting as well, and I liked that they were flawed characters that found their own paths and redemption in the end. The story is also one huge ride. There’s a certain realistic feel in the story as they often referred to something that exists in our present time. In a way, you’d think that this novel isn’t set far into the future — it could be set in the next thirty, twenty, ten, maybe even next year! There’s a certain timelessness in the novel that I liked, timeless in the sense that even if I read this a couple of years later, I wouldn’t feel like the story or the characters or scenes are dated. The author also executed the passing of time quite nicely, without boring the reader with unnecessary details just to show that time was passing. I think one thing that those who haven’t read this will ask about this book is its gore factor. Well there are no gory descriptions. But there is an overall haunting and disturbing feel once the actual harvesting was described, and it sits with you to ponder long after you’ve read that part. The words used to describe it were simple and not too scientific, and it really doesn’t say much about body parts or pain or blood, but the author had a way of writing that scene that would make you imagine every part of it clearly in your head, and leave you wondering how could anyone subject a kid to something that horrific? I can’t imagine myself in their place. Heck, I refuse to imagine myself in their place because it’s a horrible fate, no matter how much the law enforcers in the story tells me it’s not. Unwind successfully opens the doors to different issues existing now that are hard to discuss without sparking a huge debate. It’s not the kind of book you can really read simply for pleasure and to feel good. It lets you escape, sure, but it doesn’t leave you with a happy feeling after because of the questions and issues it raises. There’s so much that can be discussed after reading this book: pro-life vs. pro-choice, abortion, population control, organ donation, family, acceptance, terrorism and even religion. I don’t think one can get everything in this book in just one read. I have a feeling this is one of those books that would leave the reader pondering different issues every re-read. There are only a few instances when a book has left me speechless when I got to the end, and Unwind just joined its ranks. Good characters, compelling and thought-provoking plot, strong and hopeful ending — I cannot recommend this enough. Tina, how much was the book? Sounds interesting! Hi Rubs! I think it’s P360 in PowerBooks. Fully Booked also has copies of this for the same price but with a different (and more creepy) cover. For some reason, I didn’t like this book as much as all of you did. Hi Chachic! It’s okay, no worries. :) Maybe it’s because you’re more into urban fantasy than dystopia? I’m actually pretty new to the (adult) urban fantasy scene. I’ve always been more into epic fantasy but that’s because I haven’t been exposed to a lot of urban fantasy. I like adult urban fantasy than YA urban fantasy. Hmm well, The Hunger Games trilogy is dystopia and I liked that one well enough. I just didn’t feel that this book was compelling.